September 8: Battle of Orsha. ألبرشت دورر يخلق النقش Melencolia I.
January 10 – A great fire breaks out, in the Rialto of Venice. March 12 – A huge exotic embassy sent by King Manuel I of Portugal to Pope Leo X arrives in Rome, including Hanno, an Indian elephant. March – Louis XII of France makes peace with Maximilian I, Holy Roman Emperor. May 2 – The Poor Conrad peasant revolt against Ulrich, Duke of Württemberg begins in Beutelsbach. May 15 – The earliest printed edition of Saxo Grammaticus' 12th century Scandinavian history Gesta Danorum, edited by Christiern Pedersen from an original found near Lund, is published as Danorum Regum heroumque Historiae, by Jodocus Badius in Paris. June 13 – Henry Grace à Dieu, at over 1,000 tons the largest warship in the world at this time, built at the new Woolwich Dockyard in England, is dedicated. June – Battle of Hornshole in the Scottish Borders: Young men from Hawick defeat a raiding party from England. August 7 – King Henry VIII of England concludes an independent peace treaty with France in the War of the League of Cambrai, negotiated by Thomas Wolsey. 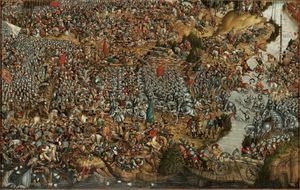 August 23 – Battle of Chaldiran: Selim I crushes the Persian army of Shah Ismail I.
September 8 – Battle of Orsha: In one of the biggest battles of the century, Jagiellonian dynasty forces comprising Belarusians of the Grand Duchy of Lithuania and Poles defeat the army of the Grand Duchy of Moscow. September 15 – Thomas Wolsey is appointed Archbishop of York in England. October 9 – Louis XII of France marries Mary Tudor (sister of King Henry VIII of England) at Abbeville, as part of the English peace with France. Albrecht Dürer makes his famous engraving Melencolia I.
Paolo Ricci (Camillo Renato) moves to Augsburg. Nicolaus Copernicus's Commentariolus, outlining his theory of heliocentrism, is written by this date. ^ Palmer, Alan; Veronica (1992). The Chronology of British History. London: Century Ltd. pp. 139–142. ISBN 0-7126-5616-2. ^ Paine, Lincoln P. (1997). Ships of the World: an Historical Encyclopedia. Houghton Mifflin. ISBN 0-85177-739-2. ^ "Hornshole Battle Site". Discover the Borders. Retrieved 2013-08-06. ^ أ ب Williams, Hywel (2005). Cassell's Chronology of World History. London: Weidenfeld & Nicolson. pp. 197–204. ISBN 0-304-35730-8.